Before I begin this Attack on Titan review, I’d like to pay homage to the brilliance of this production and urge those who haven’t been immersed in its brilliance to change that immediately. As a Sci-Fi enthusiast and constant consumer of fantasy, I have to state that Attack on Titan may be the best slice of Fantasy-Horror/Science Fiction that the world’s been blessed with in quite some time. Because it comes in the form of an anime, there are, and will continue to be a large group of people who’ll choose to not watch because this style of entertainment is out of their comfort zone. Let me for one tell you that you’re making a massive mistake. If you’re casually passing through to read this Attack on Titan review out of curiosity and have not born witness to the show, I warn you there are heavy spoilers within. If you want to be a part of this epic adventure and immerse yourself in the greatness that is Attack on Titan, get to a Netflix, Hulu, or any of the other anime viewing sites and get into it now. Trust me, you will not regret it. Episode 34, “Opening,” begins at what may be one of the most riveting times in the show’s history. In recent past we’ve learned that Reiner and Bertholdt are without question the Armored and Colossal Titans respectively. Since then the mind of the viewer has been inundated with questions on where these two came from, how are they and the mass amount of original Titans linked? What is their connection to the ever-mysterious Beast Titan? What are their motives and for whom is it that they’re fighting for? Much like Eren, the viewer’s mind is racing. Have they always been Titans? And how is it that their level of consciousness and power surpasses so greatly the majority of seemingly mentally challenged, ravenous, cannibalistic Titans of old? Evermore, what is Ymir’s role in the grand scheme? We’ve only recently learned of her Titan powers and while much of her story, secrets, and consequence are yet to be revealed, it is clear that her primary objective is to care for and protect Krista (who’s true name is Historia, a princess of royal descent). The episode opens up with three pivotal subplots. One: the Survey Corps expedition into the giant forest within Wall Maria to save Eren and Ymir from the clutches of Reiner and Bertholdt before nightfall. Two: the dynamic interaction between Eren, Ymir, Bertholdt, and Reiner during their time of regeneration in the giant forest. And three: Captain Hange’s sharp intuition into investigating Connie’s hometown, Ragako. Although this subplot is limited to one scene in the beginning, it’s gravely important. The show is very clear when presenting major points of significance, and when Ragako is focused upon in a previous episode, there are a few key points to remember in relation to the great mystery. Upon arriving there in episode 28, it is discovered that the town has been completely destroyed. However common this may be in the wake of a Titan sighting there are some highly unusual aspects to note. There are neither any signs of bodies nor bloodshed left behind. The buildings have been blundered but the stables remain intact with all the horses alive and healthy. One of the soldiers exclaims in a maddening, hopeful tone that everyone must have escaped. But how could an entire village of humans have fled a Titan attack without the use of horses or ODM gear? Why is there no bloodshed or sign of a single, mangled body? This alone is unique and something we knew would be revisited later down the line. But what’s most peculiar and noteworthy when remembering the visit to Ragako are the final moments between Connie and the visibly anorexic Titan who lay atop Connie’s flattened home. Before joining the soldiers to continue the survey of the wall, Connie hears the Titan say “Welcome Home” in broken speech. For a moment, Connie’s face fills with terror and familiarity. Reiner rides back urging Connie to keep moving. Connie’s initial response is to ask Reiner if he too had heard the Titan. Reiner exclaims he heard nothing, and Connie retorts, “But it, I Think. I don’t know how. I think… My mother.”Could that have been a transformed version of what once was Connie’s mother? Could Titans be transforming natural born humans into Titans at will? If so, which ones? Who holds that power? At the close of this pertinent scene, one notes an uncanny similarity in the eyes of Connie and the Titan he connects with, but that aspect of the story concludes there in episode 28. Fast forward to episode 34 and this incredibly enigmatic subplot is birthed once more. Commander Hange knows the importance of the mysteries that lie within the village and ensures Ragako is placed on high, investigative priority going forward. Circling back to the first subplot, this specified sector of the Survey Corps now have their most critical mission ahead in the beginning of, “Opening.” Eren and Ymir are both humanity’s greatest weapon and greatest hope in the war for survival and are being held captive by Reiner and Bertholdt. The soldiers have their work cut out for them and they’re on the clock. Not only are they plunging deep into Titan territory within Wall Maria but they’re also headed for the giant forest where they’ll inevitably face the Armored and Colossal Titans in addition to a grouping of average and aberrant ones. It’s highly possible there are far more Titan bodies waiting to emerge and the imminent threat of the Beast Titan showing up is always a factor. As they charge at full speed towards their destination they stick to their calculated and previously successful enemy scouting formation: noting Titan sightings, defeats and victories by use of colored flares and flanked positioning. Mikasa, in her ever protective quest to save Eren, almost rides beyond her given position and is reminded of Eren’s will and fighting spirit by Hannes. This gives Armin and Mikasa a powerful surge of hope as they ride towards the forest, rushing to get there before nightfall. Albeit the one exception at the castle, it is generally believed to be that Titans do not have the power to move at night, giving reason as to why Reiner and Bertholdt would wait until dusk to make their escape. We see a brief Titan sighting near one of the flanks and the soldiers continue to battle as they race against the clock to save Eren and Ymir as swiftly as humanly possible. While the two previously discussed subplots play a key role in the episode, the majority of “Opening” showcases a fascinating dialogue between both the captors and captives. The conversation and introspection that takes place among Reiner, Bertholdt, Ymir, and Eren may be as illuminating as it is perplexing. Not perplexing in the sense that one is left without the ability to comprehend, but more so adding further depth and mystery to the rabbit hole that is their reality. Initially, the audience is given a snapshot of Eren and Ymir, both of whom are suffering from severed limbs. The better part of Eren’s arms are amiss, which we learn is a result of Reiner removing Eren from his Titan shell with little care for the safety of his body. Ymir, from her stand against the Titans at the castle in episode 30, is still recovering from a severed arm and leg. As their wounds steam, it seems as though it’s not only they who need the rest but Reiner and Bertholdt as well. 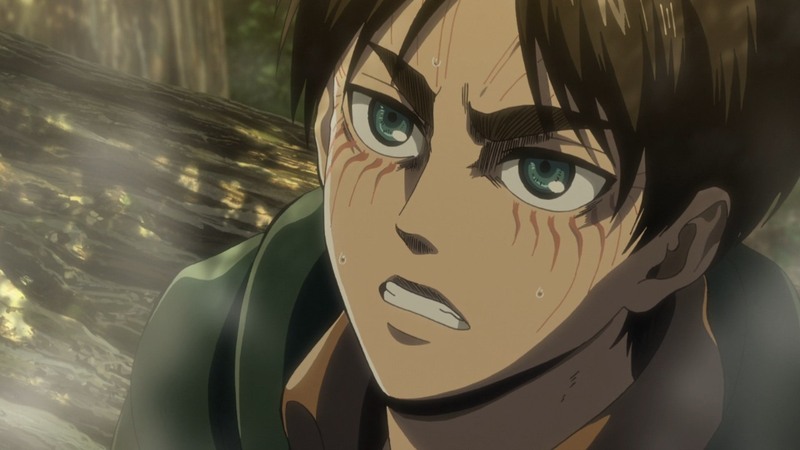 When Eren awakes he assesses the situation and is overtaken with emotion. Fueled with rage he attempts to transform shortly after regaining consciousness but discovers that he isn’t able to. Aside from being too weak to transform, Ymir adds to the predicament of doing so by pointing out their current restrictions. She notes their position as one of great risk in that it’s nestled deep within Titan territory inside the confines of Wall Maria. She then highlights the grouping of Titans at the base of the trees, all of which are patiently waiting for a blood soaked snack. She notes both the presence of average Titans as well as a few of the abnormal variety, both oddly positioned and massive in size. Most importantly, she reminds Eren of Reiner and Bertholdt, better known as the Armored and Colossal Titans. Not only are they incredible in magnitude and power when in Titan form, but have also stolen ODM gear and possess all their limbs with which to use it. Eren understands his dilemma and decides to use the time leading up until nightfall to try and gain as much knowledge as possible on the blasphemous traitors as well as Ymir. Demanding answers as to why he and Bertholdt have captured both her and Eren, Ymir begins a dialogue with the enemy. Reiner states once again his plan to take Eren, and now Ymir, back to he and Bertholdt’s hometown. He notes that it won’t happen until nightfall for the various reasons we discussed earlier. During this exchange there are some important facets to keep in mind. For one, Ymir mentions that she is unaware of how her powers really work. This will seem more and more questionable as the dialogue presses forward when juxtaposed with the knowledge she seems to possess regarding the Titan universe. Two: how does Reiner know that the Titans in the forest can’t move at night, albeit the Titans at the castle having full range of motion in darkness? Why are there so many growing distinctions between different sectors of the enemy? As they regenerate on the branches of the trees, Ymir asks Reiner for some water. Reiner responds, “Even if it’s a matter of life and death, there’s nothing we can do given our situation.” Albeit a rather odd and somewhat poetic reply, it seems to be filled with empathy. This is when the dynamic becomes most interesting. As they all reflect on how glum their current position is Reiner starts to go on a rant about requesting promotional status when they return to base. Particularly due to how hard they’ve all been working without rest or sustenance. He then remarks on how fortunate it is that the wall wasn’t broken during the last great attack. Bertholdt is visibly concerned. Ymir responds quickly, demanding to know what in the hell he’s talking about. Reiner seems to have slipped into an opposite personality, one where he believes he’s still a soldier fighting to save humanity. He continues to reply as such mentioning being saved from the Titan attack with the help of a cannon and Krista’s aid. From there he starts to daydream about Krista, mentions her potentially having a crush on him, noting special treatment he believes she’s always bestowed upon him. At this point, Eren is fed up and threatens Reiner for his preposterous words while Ymir puts it all together. Bertholdt reminds Reiner of who they are and their mission. It is then that Reiner begins to have a psychological breakdown: his mind dealing with the split life of one being a soldier fighting for humanity, and two, the embodiment of a warrior battling to destroy it. The final minutes of the episode are incredibly noteworthy. After an influx of emotional outpour from both Eren and Reiner things calm and Ymir inquires about the Beast Titan, whom of which Eren is hearing of for the first time. This is when we see that Ymir has much more information than she’s let on in the past. When Reiner questions her description and plays as though he doesn’t know as to what she’s referring to, Ymir mentions a few things that prove his denial to be false. She states with confidence that they do know of the beast, explaining to Eren that he’s the reason for the latest fiasco, noting his ability to conjure titans out of nowhere within the walls. She continues by saying that it is in fact the Beast Titan who possesses the key to Reiner and Bertholdt’s ensured passage home. Both captors are visibly shaken. Eren demands to know where her knowledge is sourced from, she declines to tell. Mentions that she has her own circumstances. As Eren’s rage ignites he demands to know who the real enemy is, but before she can answer she’s cut off by Reiner, who at this point knows her value and tries to recruit her to their side. He proposes the notion that there is no future left for this world and finishes his pitch playing on her heartstrings, promising her that he and Bertholdt will do everything in their power to protect Krista… that they understand her importance. Much time has passed and it seems as though Ymir’s loyalties have shifted and then the flares illuminate the sky. One hour until nightfall. The troops have arrived.